HICKSVILLE (WABC) -- Normal Long Island Rail Road service has resumed westbound. 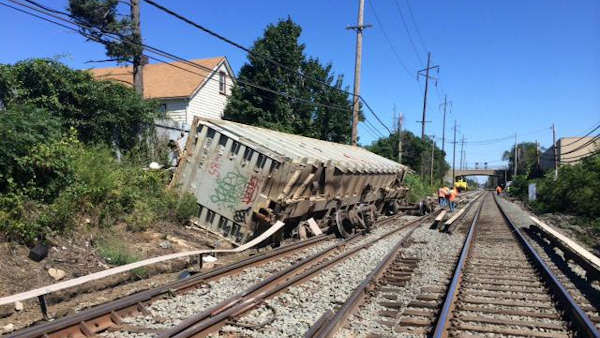 Service was suspended due to a freight train derailment west of Hicksville. Even though service has resumed, LIRR customers were advised that some residual delays were possible. Two cars out of a 16-car freight train derailed west of Hicksville on Tuesday, officials tell Eyewitness News. The freight train is operated by New York and Atlantic. It is unclear what caused the cars carrying construction materials to derail. One track was taken out of service. Emergency crews planned to bring in a crane to remove the train from the tracks, then inspect the 100 foot section of track that was damaged. LIRR customers should also check lirr42.mta.info for continuing service updates.